Learn the general structure of how to approach Machine Learning problems in a methodical way. When people think of Machine Learning, they often think of a program that is taking in data and spitting out predictions and insights. The process of performing Machine Learning often requires many more steps before and after the predictive analytics. What is it that we want to find out? How will we reach the success criteria that we set? Let’s say we are performing machine learning for a high-traffic fast-casual restaurant chain, and our goal is to improve the customer experience. We can serve this goal in many ways. When we’re thinking about creating a model, we have to narrow down to one measurable, specific task. For example, we might say we want to predict the wait times for customers’ food orders within 2 minutes, so that we can give them an accurate time estimate. Arguably the largest chunk of time in any machine learning process is finding the relevant data to help answer your question, and getting it into the format necessary for performing predictive analysis. We know that for supervised learning, we need labeled datasets, or datasets that have clear labels of what their ground truth is. For an example like the restaurant wait time, this would mean we would need many examples of past orders, tagged with how long the wait time was. Maybe the restaurant already tracks this data, but we might need to augment the data collection with a timer that starts when the customer orders, stops when the customer receives their food, and records that information. Creating this system of recording data, as well as gathering enough data to be able to train our model will take time. You may also want to visualize the data, perhaps using box plots to identify outliers, histograms to show the basic structure of the data, and scatter plots to examine relationships between variables. We might glean from this that there are two main groups of orders. One group seems to cluster around 4 minutes, while another, smaller, group seems to cluster around 11 mins. We could use this to modify our question and build a model that will classify whether or not an order will be in this “short” timeframe, or in the “long” timeframe. Is it dependent on the food that it ordered? The time of day of the order? Perhaps we just become aware of the bimodality of our data. If our model consistently predicts a wait time of around 6 or 7 minutes, then we are not taking into account the true structure of our data. Real data is messy! Data may have errors. Some columns may be empty. The features we’re interested in might require string manipulation to extract. Cleaning the data refers to the process by which we address missing values and outliers, among other things that may affect our insights. We may see that we have a group of orders that took over 20 minutes, due to an emergency in the kitchen one afternoon. This is pushing our average wait time up, and may skew our predictions. If we want to model the more general functioning of the restaurant, we may want to remove these values. 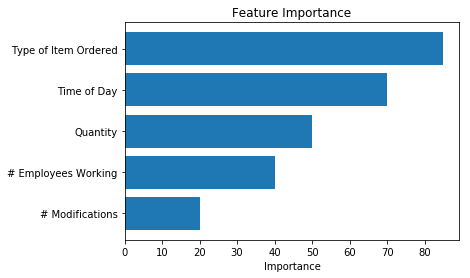 Feature Engineering refers to the process by which we choose the important features (or columns) to look at, and make the appropriate transformations to prepare our data for our model. After we test our model on the data we have, we might go back and reengineer features to see if we get a better result. Once we understand our dataset and know the problem we are trying to solve, we can begin to choose a model that will help us tackle our problem. 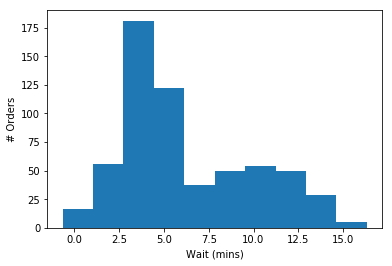 If we are attempting to find a continuous output, like predicting the number of minutes someone should wait for their order, we would use a regression algorithm. If we are attempting to classify an input, like determining if an order will take under 5 minutes or over 10 mins, then we would use a classification algorithm. The different classification and regression algorithms work better on different types of datasets. We use different models on categorical and numerical data, and different models on datasets with many features and datasets with few features. Our models also have different levels of interpretability — how easy is it for us to see what these results mean and what led to them? When we teach the models, we will discuss the tradeoffs of using each one. We often want to set a metric of success, so that we know the model we’ve chosen is good enough. Are we looking for accuracy? Precision? Some combination of the two? We discuss this in our lesson on Precision and Accuracy. Each model has a variety of parameters that change how it makes decisions. We can adjust these and compare the chosen evaluation metrics of the different variants to find the most accurate model. 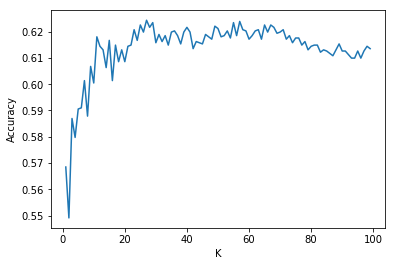 For example, let’s say we’re using a K-Nearest Neighbors regression algorithm to solve the wait time prediction problem. This algorithm uses a parameter k, which you will learn about in the KNN lesson. We can adjust k to get different results. From this analysis, we would set our k to be 26, which got the highest level of accuracy. When you achieve the level of accuracy you want on your training set, you can use the model on the data you actually care about analyzing. The output would be how long the order is expected to take. This information could be displayed to users. An important step is being able to convey what you’ve learned and created, so that people can use it in the future. The process we have outlined is a fairly standard process for performing machine learning. As you get experience going through this process on your own, with your own problems, you will start to form your own process. The steps may not be linear! As you clean your data, you may uncover a better question to ask. As you tune your model, you may realize you need more data, and go back to the collection step. The important part is to stay curious, and to keep iterating until you find a model that works the best!